A Fine French 19th/20th Century Louis XV Style Gilt Wood Carved Figural Trumeau Mirror. 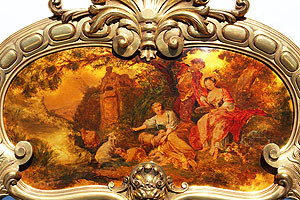 The elongated frame crowned with a carved floral shell above an allegorical mask of a satyr and centered with an oil on panel painting depicting an outdoor romantic scene of two maidens and a standing young man, sheep, flowers, trees, a lake and park sculptures. The banded and acanthus carved sides ending with scrolled leaves and shrubs and centered with a beveled mirror plate. 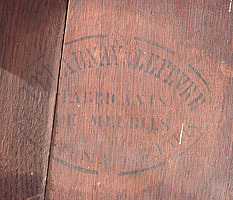 The back stamped "''Delaunay & Lefevre / Fabricants / de Meubles / 57 Faub & St. Antoine, PARIS''. Circa: Paris, 1900. 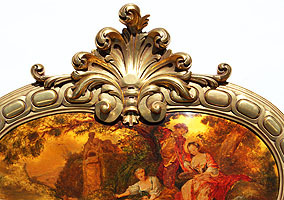 A Fine French 19th/20th Century Louis XV Style Gilt Wood Carved Figural Trumeau Mirror. 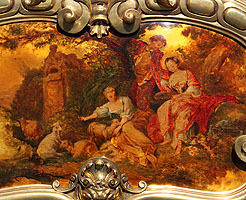 The elongated frame crowned with a carved floral shell above an allegorical mask of a satyr and centered with an oil on panel painting depicting an outdoor romantic scene of two maidens and a standing young man, sheep, flowers, trees, a lake and park sculptures. The banded and acanthus carved sides ending with scrolled leaves and shrubs and centered with a beveled mirror plate. The back stamped ''Delaunay & Lefevre / Fabricants / de Meubles / 57 Faub & St. Antoine, PARIS''. Circa: Paris, 1900. 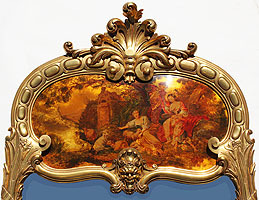 Click here to view the matching, but slightly shorter, pair to this Trumeau.